The official tagline of my website is “Take Your Kids Everywhere!” The unofficial continuation of that is “…but never pay more than you have to.” I love finding the coolest experiences in the world and figuring out how to do the same things for less. With three kids, that’s the only way I can show them the world. Given that I’m a travel planning geek with a backpacker mentality and a love of luxury, every time I receive a brochure for a private jet trip in the mail I wonder how I could create a similar trip for less money. After all, the trips run $50,000-$150,000 each, which is significantly outside of the average family’s travel budget. That doesn’t mean that an average family should forego an amazing around-the-world adventure, however. Before I start, if you haven’t received the brochures, you’re probably wondering what I’m talking about. The three primary companies that run regular jet trips are National Geographic, Four Seasons and Abercrombie & Kent. National Geographic‘s trips are theme-based (e.g. around Africa, major religious sites, human ingenuity, or amazing animals), run two to three weeks, and cost between $56,000 and $84,000 per person. Abercrombie & Kent‘s trips typically go around the world in 20-26 days and are priced between $92,000 and $147,000 per person. Four Seasons‘ trips are all about luxury. 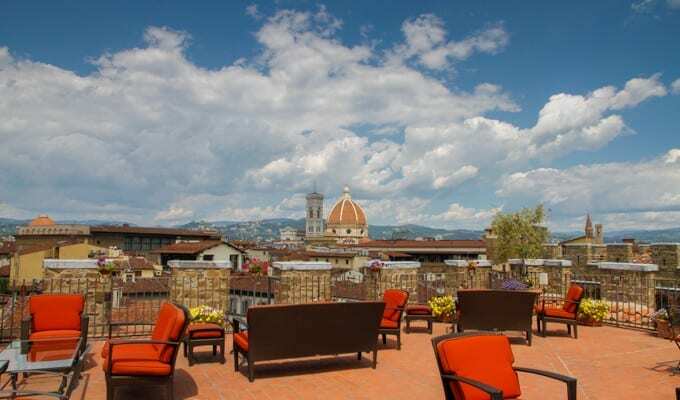 They’re centered around stays at Four Seasons properties, criss-cross large portions of the globe in 19-24 days, and are consistently priced at $135,000 per person. You don’t have to deal with airports, security, customs or immigration, and you don’t have to arrive two hours before each flight. Hand in your passport when you depart – you’ll get it back at the end of the trip. You don’t have flight connections. The jets fly from one location to the next on routes that typically aren’t flown commercially. You don’t have to wait at the airport for luggage or transport it yourself – it’s waiting for you at each hotel. There are experts accompanying you. I know photographers who have traveled on the NatGeo jet trips, and they go above and beyond at each stop to make sure the photographers on board get great shots. The other experts on board talk about the culture, history, geography and politics at each destination. 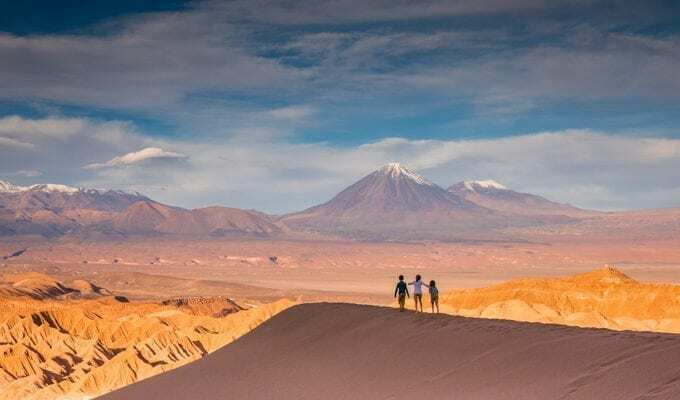 Having traveled to Antarctica with National Geographic, I can attest to the value that these experts add to a trip – you’re traveling with some of the most interesting people in the world. There are excursions and activities planned everywhere, from hot-air balloon and helicopter rides to dogsledding and private-access to historic sites. You’re kind of packing a lifetime of cool experiences into three weeks. The lack of flexibility. The itineraries are expertly-crafted, but for world travelers in that income range there will invariably be destinations that they’ve already visited. And if you want to substitute Bora Bora for Budapest, or stay in the Maldives for a few extra days, you can’t make those changes. They’re not kid-friendly. So few kids go on these trips that nothing is optimized for them – they would be dragged along on an adult vacation. What would it cost to create a trip that’s virtually identical to one of the private jet trips mentioned above? Is it worth going on that less-expensive trip? How would I create a unique around-the-world trip instead? 1. What Would It Cost To Create A Private Jet Trip Using Commercial Flights? For this comparison, I’m looking at Four Seasons’ International Intrigue trip. It’s a straightforward itinerary for $135,000/person for two people, or $147,000 for a solo traveler, that travels to major cities. It’s not the most expensive private jet trip offered nor is it the cheapest. And even though I haven’t been on the Four Seasons private jet, I’m very familiar with Four Seasons hotels and resorts, having stayed at eight of their properties around the world with my kids. It’s one of the only brands that consistently finds a perfect balance between luxury and kid-friendliness. Plus the last jet brochure that I received (literally yesterday) was from Four Seasons, which prompted me to finally sit down with a sharp pencil (ok, spreadsheet) and do the math. The exact routing of this trip would be Seattle-Osaka-Beijing-Male-Arusha/Serengeti-Budapest-St. Petersburg-Marrakech-Boston. To price this itinerary, I looked primarily at one-way tickets. There aren’t a lot of planes/routes anymore with First Class cabins, so I eliminated that as a search option even though it’s most directly comparable to the service level on the private jets. In all cases I chose flights that were the best value, taking into account price and trip duration. This was a quick calculation. In reality if I were booking a complicated itinerary like this, I would look into the around-the-world tickets offered by the three airline alliances, and play with other flight options like multi-leg tickets when there’s an airline that flies several of the consecutive routes. That would take hours of work but it could reduce the pricing by as much as 1/3. Or I would just use a travel agent. In addition to the flights above, you would require a train ticket to get from Osaka to Kyoto and back. I’m pricing that at $250. 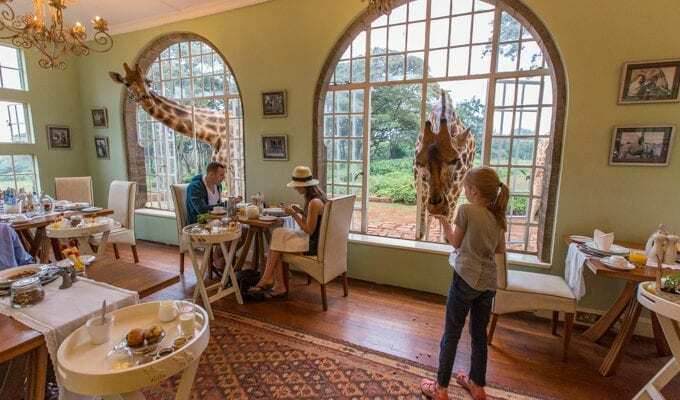 You also require a flight from Arusha to the Serengeti at $500 round-trip and airport transportation in Seattle, Beijing, Budapest, St. Petersburg, Marrakech and Boston. For simplicity’s sake I’m going to price that at $100 per destination. So that’s another $600. For hotel pricing I’m using dates exactly one week after the private jet trip, since the hotels already have large blocks of rooms reserved for the jet participants which tends to increase the prices of the remaining inventory. In all cases I chose the refundable room rate for standard rooms and included breakfast and taxes. Hotel prices obviously fluctuate by day and season, and how far in advance you book, but these are accurate as of February 2017 for travel in late September/early October. I’m converting to USD through the Four Seasons checkout option. The total for the hotels for 2 people works out to $18,354.87, or $9,177.43 per person. If you’re a solo traveler there’s a de facto single supplement of $9,177.43. Obviously you’re going to eat (and drink) very well on the Four Seasons trip. Disregarding meals eaten on planes, for lunches, dinners and drinks I’m going to do a quick calculation of 22 nights at hotels multiplied by $200/person. That’s $4,400/person. Obviously if you’re traveling on a budget you can eat for a lot less than that, but I’m trying to compare apples with apples. Let’s assume that you’re not going to be booking private dinner experiences in the desert or helicopter rides, but that you want knowledgeable guides everywhere and some unique experiences where possible. Throw in a couple of spa appointments and I’m budgeting this at $600/day per couple. That adds up to $13,200 per couple, or $6,600 per person. Again this is highly variable and meant to be a ballpark figure. Four Seasons Bora Bora. Well worth a stop! 2. Is It Worth Going On This Less-Expensive Trip? So let’s say you’re excited about the savings you would get booking the trip yourself, and you would love to stay at those same Four Seasons properties. The question now is whether you would want to book this exact trip. Short answer: no – because of the flight routing. Some of these flights are straightforward and only slightly longer commercially than on a private jet – Seattle-Osaka-Beijing and Budapest-St. Petersburg specifically. Others get increasingly more complicated, with multiple stops and long layovers – especially Beijing-Male, Male-Arusha, Arusha-Budapest and Marrakech-Boston. Brett Snyder of Cranky Concierge sums it up nicely: “No sane person would do a luxury vacation on a route like this with commercial flights.” The second point that I made at the top, under Advantages? That’s huge. A private jet is the only way to fly those routes without wasting a lot of time in transit. But an around-the world trip is an incredibly cool thing to do once in a lifetime. It gives you a chance to see a lot of your dream destinations with your own eyes, and see just how small the world really is. It’s not always feasible, given limited vacation days and the cost of travel, to fly to the Taj Mahal one year, Bali the next, the Serengeti the next and Sydney the year after. But to see all of them in one multi-week vacation, with very little wasted time or expense, is an extraordinary experience. A decent stop between Beijing and Male would be Chiang Mai, Thailand. This is at the Four Seasons Chiang Mai. 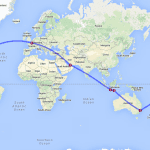 Last year, partly inspired by these jet trips, I traveled around the world in two weeks with my ten-year-old. We flew in business class the majority of the time, we stayed at nice hotels everywhere (including three Four Seasons properties), and the final tab came in under $10,000 total, or $5,000 each. That was shorter than the private jet trips, stopping seven places in six countries – the private around-the-world trips hit anywhere between 8 and 15 countries – but it was an amazing trip. 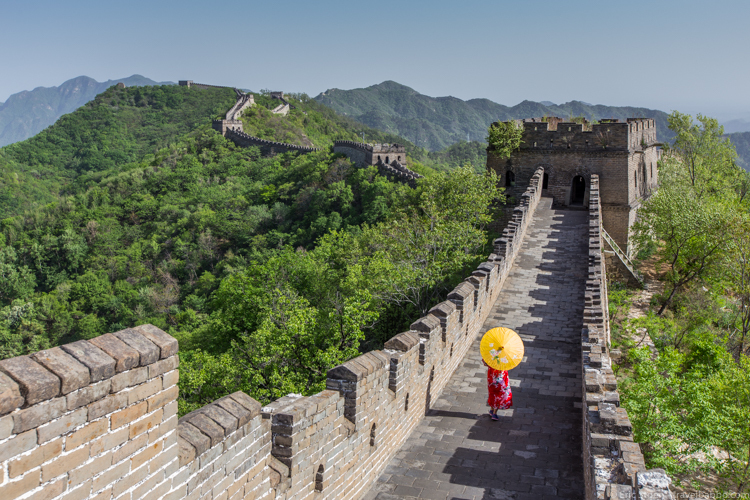 My daughter realizes now just how easy it is to travel anywhere in the world, and she wants to see it all. Fly west. The more I’ve thought about our eastward routing last year, the more I realize we made a mistake. Most of these jet trips head west – that means you lose a day crossing the date line but you gain a couple hours at every stop. Choose eight countries/destinations on five continents and spend 2-3 days at each place. Fly in coach for daytime flights and business class for overnight flights – the better you sleep on the plane, the less time you waste at the next destination adjusting to the time change. I would guess I could create an itinerary of half-business, half-coach flights for $4,500 per person, in addition to using some miles for upgrades. I would create the itinerary based on easy flight options. A connection on a few of the routes is fine, but I would avoid routes like Male-Arusha that just can’t be done in under 14 hours. 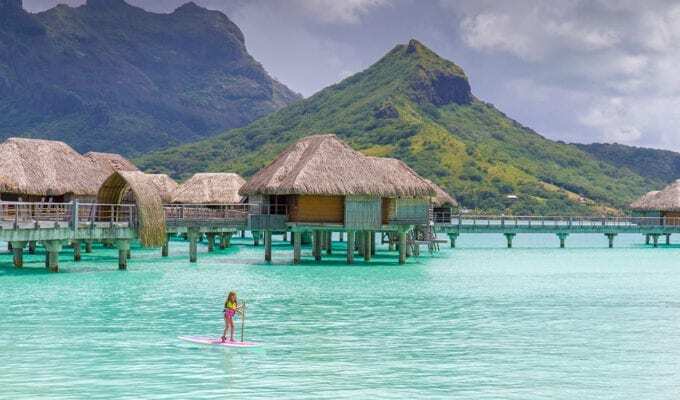 I’d be tempted to stay at a lot of those Four Seasons properties, but I would want our average hotel pricing to come in under $500/night – we could splurge at some amazing places (hello, overwater bungalows!) as long as we were balancing that out with moderately-priced city properties. Based on past experience, meals and activities wouldn’t add up to a lot – maybe $200/day total. Adding in transfers and misc, this is a $12,350/person trip with moderate luxury and a lot of adventure. That’s not inexpensive, but it’s a lot less than $135,000, it’s less than a series of individual trips to the same destinations would be, and it’s all customizable. If you add another person to your trip, assuming that you can have three people in each room, it brings the average cost down to $10,000/person, and a fourth person would get the average below $9,000. And of course it’s possible to spend less on hotels, meals and activities, as we showed going around the world for under $5,000 each last time. Note: I haven’t looked at pricing for manually piecing together any of the NatGeo or A&K itineraries, but I would expect that percentage-wise it’s roughly the same as the Four Seasons. And if I ever win the lottery and go on one of these trips, I’ll update this post with more pros and cons! How about you? What’s your dream trip? If you had $100,000+ to spend on a private jet trip would you do it, or would you rather plan a trip yourself? What an interesting breakdown! I love how you also show that is possible to take a luxury round the world trip for far less than a private jet. Great breakdown! How did you manage to do your own trip for $5K each in business class- did you use points for the airfare? Thanks Tamara! It was $5,000 total for two of us – $5,097 to be more specific, plus 110k miles – and we were in business class for 35 out of 52 hours on planes. I go into the planning/booking in this post.